It is not often I start writing a book review half way through but in the case of Teri Terry’s Mind Games I feel compelled to. The reason why? I am not sure if I want to continue reading the story. I will finish the story but it is a struggle. I was lucky enough to be provided with an advanced copy by Net Galley for an honest review. Luna (named after the Rowling’s Luna Lovegood) is high school kid who is a refuser in a world where everyone is hard wired to cyberspace. As a refuser she does not partake in the cyber world. At school she is ostracised because of this. When the novel opens Luna and Hex are pulling off a major prank. The story has promise at this point, I am engaged and liking the characters. The world Terry has created is rich in detail and believable. The move to society that is controlled and lived through an online world is interesting and believable. The first quarter of the book is really looking good and then things begin to slide as you are provided with a great deal of information and it slows the story down. I had to wonder how much of this information that was provided was actually needed as it did not seem to move the story forwards. All this information does not seem to have a purposed and it is not until the halfway mark that you start to get answers. It is also by about the half way mark that Luna as a character becomes disconcerting. Now, I am not expecting in every dystopian novel, a kick arse save the day heroine, I like flawed characters but Luna is flat. Luna is meant to be special, she is wanted by the powers that be and everyone wants a piece of her but I do not begin to fully understand why until the half way mark. She is a refuser but then very quickly capitulates at the first offer to plug in, she is dragged from drama to drama and she never seems to know why or what she is doing. Perhaps what really bothered me about her as a character is that Luna does not seem to have any real sense of purpose or conviction. The rest of the characters and there are a lot are okay but there does not seem to be anything that makes them special or anything that makes you feel any connection with them. Many of the characters appeared to have one purpose and that was to push Luna in a certain direction. The book started off at cracking pace was engaging and then the second quarter became bogged down and the second half was considerably better. 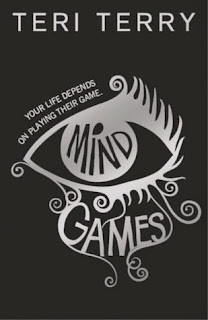 With Mind Games the author Teri Terry has created an interesting world but at times allowed it to take over the story.